In fun holidays in Sanlúcar de Barrameda should not miss a beach day full of sun and where you will be able to play volleyball. That?s why we recommend you to spend a day in Beaches of Sanlúcar de Barrameda while your stay in Hostal Gadir. Moreover, in the surrounding area you will be able to taste the most typical dishes of the area. 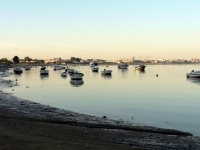 The coast of Sanlúcar de Barrameda offers the possibility to visit special places such as Playa Bonanza, which is part of the tradition and history that have marked the town, leaving traces of the ongoing time. During our visit to Playa Bonanza you can enjoy a day of relaxation, have a good swim or simply walk around this charming area. And on the way back to your place of accommodation in Hostal Gadir discover the surprises that the streets of Sanlúcar de Barrameda offer . These are some of the choices we recommend you to enjoy a beach day in Sanlúcar de Barrameda.